The VP debates last night weren’t quite what I expected. I think both candidates held their ground fairly well. Neither really stood out as being a clear winner or loser. Neither of the candidates answered the questions asked very well. Especially Palin who openly stated what she wanted to talk about and then did it. Joe Biden spent a lot of time talking about himself as opposed to Barack Obama and the ticket. He seemed very reserved when at many points it looked like he wanted to either a) burst into laughter or b) walk across the stage and kick the governor in the shins yet he maintained his composure. 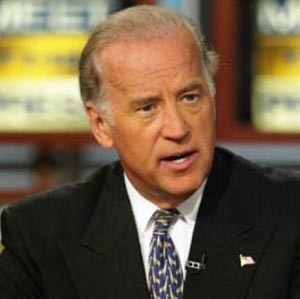 Overall though I feel Senator Biden came across as the more experienced vice-presidential candidate despite lacking anything of great substance or impact. 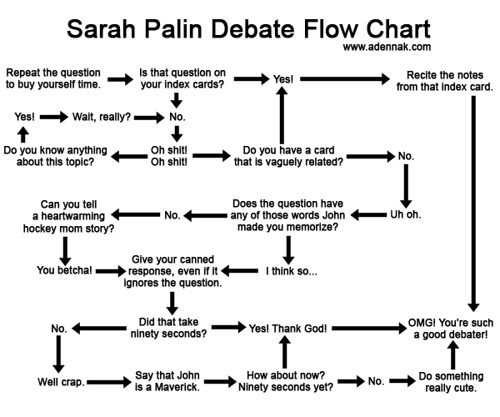 Sarah Palin far surpassed my expectations. After her past interviews, I thought that she would likely stutter her way through this event as well. I don’t think she did fantastic but, I set the bar low enough that she was alright. I felt like she had a few things she knew about and that was all she wanted to talk about….i.e. energy…so she talked about energy for almost every question asked. 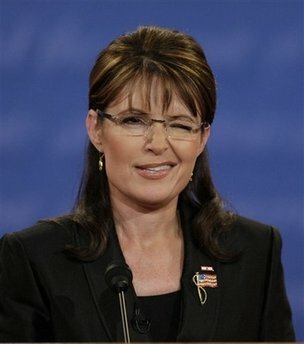 The things that I have to say drive me insane about Governor Palin: the overuse of the term ‘maverick,’ the constant mispronunciation of the word ‘nuclear’ (in a thirty second period she said ‘nucular’ six times), and last but certainly not least the smug grins and winking. I don’t know who she was winking at but I don’t feel it was necessary. So overall, the first and final VP debate was anticlimactic for me. I don’t think that it will likely impact the polls in anyway. Unless maybe, just maybe, other people hated the winking as much as I did. Tonight is the first presidential debate between Obama and McCain. Next Thursday (Oct. 2) is the VP debate between Biden and Palin. Be sure to watch. Only 40 more days until the elections. Election time is near. Time for those debates. Though McCain would like to postpone due to our economic crisis, Obama rejected his request. I’m always interested to see how the candidates perform. I feel that any candidate running for these offices needs to be able to handle a traditional debate. It is a test. One of many that they need to pass to demonstrate their qualifications to hold the office. I know that the answers are very rehearsed but it shows a lot about their ability to handle pressure and a little bit of the unknown with the opposing response. The debate has the power to win or lose an election for a candidate. It is one of very few opportunities for our country to compare and contrast both major candidates. As much as I look forward to John McCain and Barack Obama, I am more excited to see how Joe Biden and Sarah Palin handle their VP debate.